This page is about our yacht, Catlypso, which we purchased in June 2014. It was formerly called Pieces of Eight. 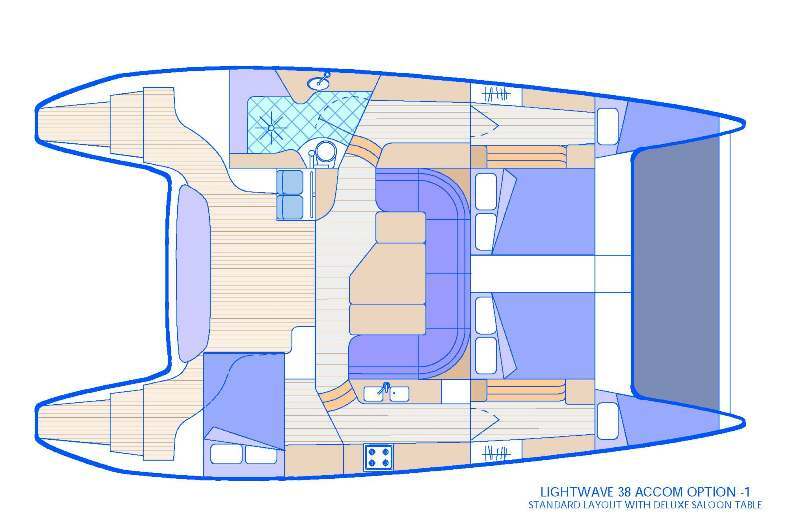 The layout of the yachts are not all the same, but the standard is as per the diagram below. This is exactly the same as the layout of Catlypso. 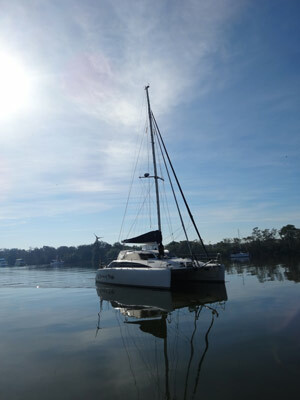 Catlypso was built by Lightwave Yachts at Coomera, Queensland (on the Gold Coast) as Pieces of Eight. It was the 33rd Lightwave Yacht built and the 16th 38 footer. All but one of the other 17 yachts were 35 footers, basically the same design, they just had shorter boarding platforms. She was launched in November 2004 as a "Stage One" build. This means that Lightwave only built the hull (and perhaps installed the propulsion systems) and the rest of the boat was finished by the owner. The work on the rigging, sails, wiring, plumbing, cabin fitout etc was carried out by contractors organised by the owner. Quite a few of the Lightwaves at this time were sold as "Stage Ones", something that is no longer done. I presume that this was done either to spread the expenditure over a longer period or to try and save costs. I think that Lightwave may also have found it advantageous at that time as they were building eight yachts a year, amazing for a small company, and may not have had the ability to build so many if they had to finish all of them. The original owners only had Pieces of Eight for just over two years before it was sold. 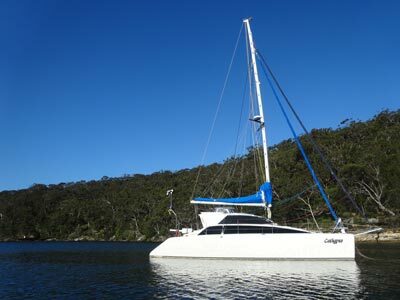 In July 2007 she moved to Sydney and appears to have been kept at Akuna Bay, at least at the start. 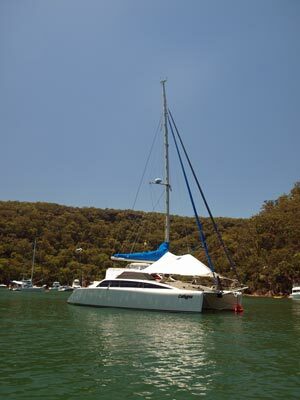 In 2009 she was sold again and moved back to Queensland, this time to Mooloolaba (was there in August 2009). It seems that from about late 2011 or early 2012 the boat was basically not used. It came on the market in March 2014 and we purchased it in June 2014. There is large rear door from the outside cockpit area and inside this there is a the main saloon which is the living area with dining table and lounge. The table sits at least six. There is an AM/FM radio and television in the back port corner. There are two LED lights above the table and two LED reading lights on the forward side of the lounge. There is some storage under the radio and the radar display is in front of the TV. This is a pain as it blocks part of the TV screen so I will need to investigate moving it somehow. There is a large amount of storage under the lounge seats, but about one third is home to the main batteries. We store food for long voyages here (as well as beer and wine!). There are two large hatch windows at the front which let lots of air in. The port side window next to the door hinges up so the skipper can talk to those inside. 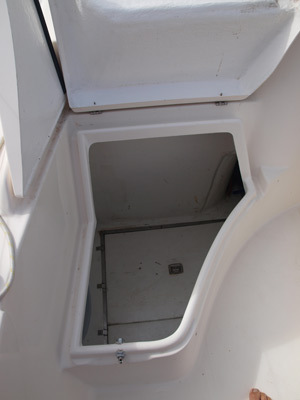 There is also an escape hatch in the floor in the unlikely event the boat capsizes. There are steps from the saloon down to each hull. 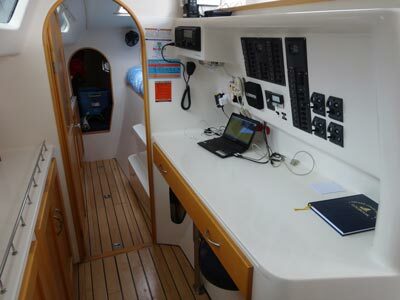 In the port hull between the bathroom and cabin and accessed from the saloon, there is the navigation and and "chart" table. This has all the communication gear on the inside wall, with all the switches for the electrics as well. There are two 12 volt outlets here and a double power point. Under the map table is a large "map" drawer. Under the drawer there is a 240 volt inverter as well as a 10 stack DC player (this will be removed as we are no longer using the radio it was connected to). The area is lit by an LED light above as well as another light that can be set to glow red (for night time to save your night vision). 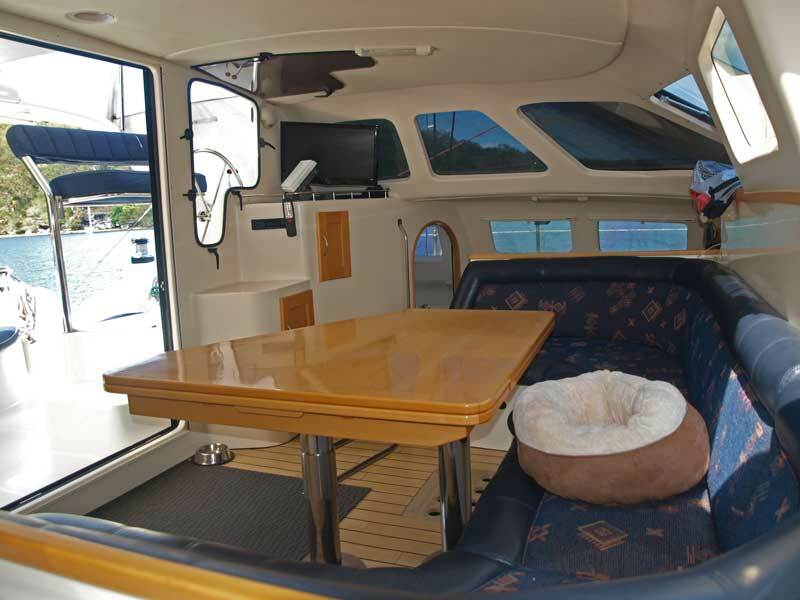 There are three cabins/bedrooms as well as two single berths. The port hull has one queen size berth in front of the navigation area and under the forward deck. In front of this there is a single berth in the bow, but this is very cramped. There are two hatches above the bed, a large one above and a smaller one facing the front. There is an LED light above the hull centreline and two reading LED lights above the bedhead. There is a double power point on the outer wall and an LED light in the bow berth. The port side queen bed. This is our cabin. There is a cupboard for clothes just inside the door. Under the floor there are three sections of storage space and there are more cupboards on the outer side of the hull between the clothes storage and the bow. 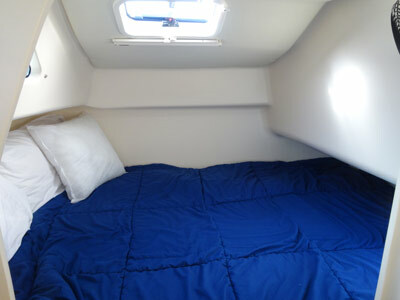 The starboard side is a mirror image of the above cabin, that is, another queen size bed etc. The starboard side queen bed. This is the guest cabin. At the rear of the starboard hull there is a double bed. This is a lot smaller and lower than the queen size beds. There is an LED light just inside the cabin and one LED reading light. There are two cupboards in this cabin, but we use them for food and drink storage at the moment. There is also a very large storage compartment under this berth. However, as the watermaker is also in this compartment it limits what you can put in here as you need to be able to access the controls every three to five days. You can also access part of the engine room via this area. The galley is in the starboard hull adjacent to the main saloon. 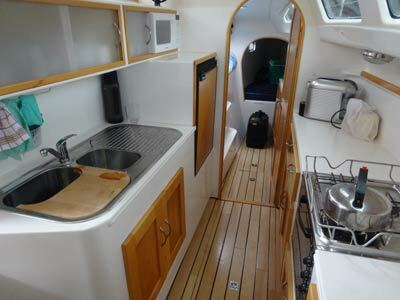 There is a three burner LPG stove and oven (two 3.7 kg bottles are in cockpit), a lot of kitchen top space, a double sink with hot and cold water, glass and cup storage above, small upright fridge forward of this and a microwave above. There is storage under the sink and the kitchen tops. When in the galley, you can talk to the people in the main saloon and even the skipper. There are two double power points here as well as one behind the microwave. There is also an LED light above. 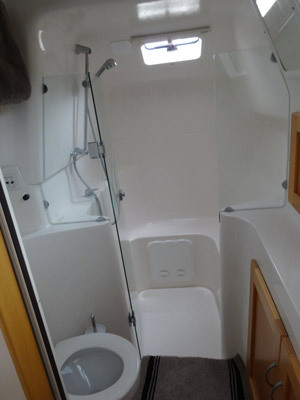 The bathroom is located in the rear of the port hull. There is a full size toilet which can flush either to a 50 litre holding tank or directly to the sea. It uses salt water to flush via an electric pump/macerator. There is a sink opposite the toilet and under this some storage. To the rear of this is the shower, separated from the toilet by a glass door. This is huge, you could have a party in here! There is a seat as well. The water is hot (from the port hot water tank) and cold. There is a small hatch above the shower and an LED light above the toilet section and a double power point. Under the bench is some storage space in a cupboard and also a vanity next to the sink. You can also access the front of the engine via a hatch in the rear wall of the shower. This is handy as you can check oil and operate the thru-hull to dump the holding tank. Outside the main cabin there is a medium size cockpit area which has a raised helm position on the port side. This has a seat which can seat two people. The helm area has canvas on all four sides, with clear sections for windows. We had this remade in April 2015 as the old one was falling apart. There are steps leading down to the water and steps leading up to the topsides on each side. On the starboard side there is a ladder giving access from the water. Most winches are located back in or near the cockpit. There is a small table on the starboard side of the door with space for three or four to sit around. There is also a long seat at the rear and another small one behind the helm seat. Under the helm there are two fridge/freezers. These can operator individually, so you can have a fridge and a freezer, two freezers, two fridges or nothing. They are quite large, 40 litres each. The cockpit. LPG is under photo is taken. Fridge/freezers under helm. Storage under long blue seat cushion. The two 3.7 kg LPG gas bottles are stored under the seat near the table and there is storage under the rear seat and the smaller seat. At the helm are all the instruments, which includes wind, depth, speed, chartplotter, forward looking sonar, autopilot and chain winch control (see below for details of all this equipment). As mentioned before, you can access the radar display through the open window. The winch for the genoa is also accessible from here. The rear is lit by three LED downlights as well as LED spotlights which point towards each transom (and the BBQ on the starboard side). 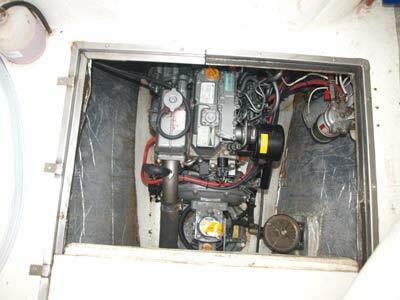 We have two 30 hp Yanmar 3YM30 diesel engines which drive the feathering props via Yanmar SD20 saildrives. These are located behind the double berth cabin and the bathroom. Access is via hatches built into the steps to the top deck. Under these hatches are false floors which are removed to get to the engines. 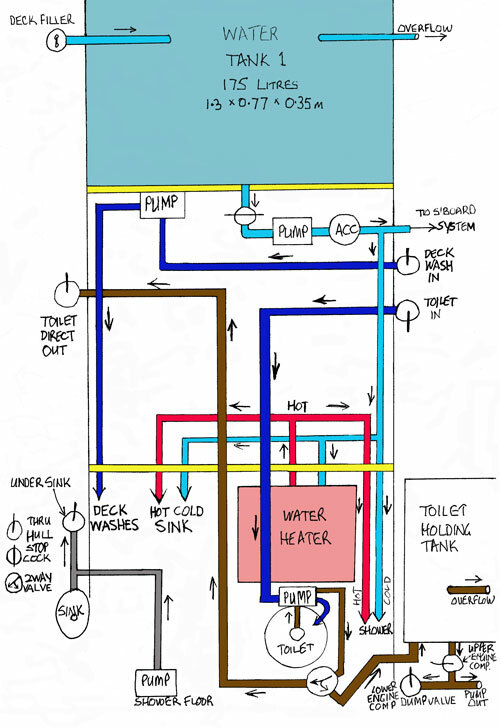 The port engine is relatively easy to work on, as it has access to the front of the engine via a hatch in the shower. However, the starboard one is much harder, as there is no similar access, although it could have been easily provided. For the starboard engine, the impeller and both v-belts are extremely difficult to access as there is only about 50 mm of space between the engine and the bulkhead. The raw sea water strainer and the primary diesel filter are also quite hard to access as they are right up in the front corner. There is a fluorescent light in this engine room. Checking and adding oil as well as the oil filter are easy to access on both engines. Most owners seem to run one engine at a time if they are cruising and use about 2,200 rpm. This gives a speed of about 5.5 to 6 knots. If both engines are used at this speed you only get an increase of perhaps 0.5 to 1.0 knots. At 2,200 rpm, the engine uses about 2.2 to 2.3 litres of fuel an hour, very economical. The fuel tank is 200 litres. This is located in the centre of the boat in the anchor locker, just forward of the mast. The fuel gauge is a plastic tube with markings showing how much fuel is left. Thus the range under power is about 500 to 520 nautical miles (just over 900 kilometres). With five 20 litre jerry cans (which really hold a total of 110 litres) you can add more than 50% to this range. We will probably store these in the upper port engine compartment. The mast is 15.3 metres high, perhaps 17 metres off the waterline (I will need to work this out more accurately). The main sail is 47 square metres. This was purchased new in September 2014 from Doyle Sails and is made from CL90. We have an overlapping genoa (110%) which is 29 square metres. This was also purchased new in September 2014 from Doyle Sails and is made from CL90. This is on a roller furler. There is also a screecher which is 47 square metres. I do not know when this was purchased, but it is in very good condition. It is also on a roller furler. It is a really nice sail to use in light or following winds. We also have a asymmetrical spinnaker which has not been used yet. Our primary navigation tool is a Raymarine A70 chartplotter located at the helm. This currently has all the Australian charts installed. It is also connected to the autopilot and the AIS. You can set a waypoint and the autopilot will steer to this point. You can also set a direction. As a backup, and also for planning purposes, we run a laptop with MemoryMap installed. This also has all the charts for Australia on it. We also run OpenCPN with Google Earth satellite photos for all the major ports and islands that we plan on using. We also have a tablet with OpenCPN and the Google Earth photos for use at the helm. We will also add to this any other locations we hope to visit. We now have a dedicated laptop for the navigation software as well as two backups in case something goes wrong with the primary one. We also have a Garmin 128 GPS at the navigation table. This is a simple GPS with only lat/long etc available. It does, however, have a good anchor alarm and is located right near our cabin. This connects to the VHF radio so that the VHF has our location. There is also a Coursemaster 850 Autopilot which also shows GPS co-ordinates. As mentioned above, this is linked to the A70 chartplotter (that is where the GPS comes from). You can set a Go To point on the chartplotter and then the autopilot will navigate to it. In times of limited visibility, we have a Furuno 1715 radar and a GME 120 AIS. 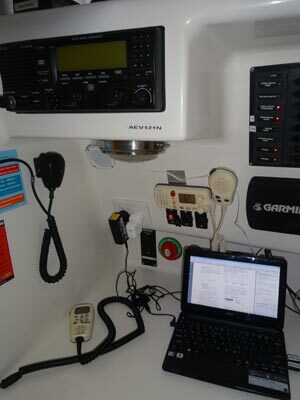 The AIS is connected to both the chartplotter and the MemoryMap and OpenCPN software on the laptop. This means we can "see" ships on the chartplotter well before we actually physically see them. It also means that we broadcast our name, course and speed and other AIS equipped vessels nearby can see us as well. Our MMSI is 503019080. Of course, there is also a Plastimo Contest 130 compass at the helm. There are the normal sailing instruments, wind speed and direction, depth and speed. These are all Raymarine ST60 devices. The speed and wind devices are linked together and I hoped to link these to the laptop in early 2015 but still have not got it working. There is also an Interphase Outlook forward looking sonar. This can also look down like a normal sounder. On board we have an Icom IC-M402 VHF radio (with DCS - connected to GPS) and two handheld Icom VHF radios. The M402 also has a remote handset at the helm. We have two portable VHF radios for when we go out in the tender or ashore. There is also an Icom IC-M710 HF radio with an AT130 tuner (uses the mast stays as an antenna). A few tests have shown we can receive transmissions from as far as Longreach in western Queensland and transmit to the western side of the north island of New Zealand. Our call sign is VJN4818. We have a couple of UHF radios for local communications and a Spot 2 device that enables us to advise our friends and families of our location (normally updated at each mooring and at noon when travelling). This uses the satellite phone system to communicate and is linked into our Facebook page and our web site. It can also be used for notifying of an emergency. Of course, we also have an EPIRB (a GME 406G) and a spare one on longer trips (GME 406 from our other boat) and as well, two PLBs attached to Kelly and my lifejackets. 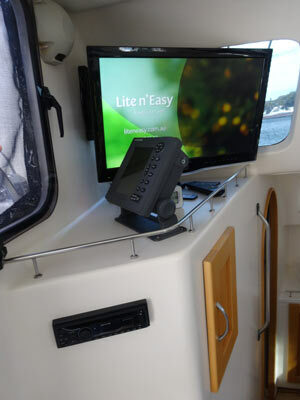 The boat also has a wireless modem that uses a mobile phone SIM to connect to the internet (and phone network) and provides all wireless devices on the boat with internet access. We have a Telstra SIM with prepaid access for this. We need to add an aerial to extend the range. Catlypso has a Palsonic 26 inch flatscreen LCD TV with a super Digi dual tuner. This also plays DVDs. I have a hard drive with lots of movies and television shows that I copied from our DVDs. These can be run through the TV. We also have a Bauhn AM/FM radio with CD player, bluetooth and USB input. This has speakers in the main saloon and also in the cockpit. There are six solar panels, five of 80 watts and one 120 watts (I think). This gives 520 watts all up. There are four mounted on the tender davits behind the cockpit, another above the helm and one more above the cockpit table. When we purchased the boat we were told there was 820 amp hours of house batteries as well as two 100 amp hour starting batteries. However, we later figured out that there were 910 amp hours of house batteries. This was made up of four 100 a/h and two 255 a/h. During our 2015 trip the batteries did not perform as well as we expected, at least for the first 5 or 6 weeks. Later they were okay. However, over Easter 2016 we had big problems, with the batteries not holding a charge for more than about 8 hours when the freezer was running. I removed one 100 amp hour battery (which I thought had failed) from the bank and it was a bit better, but still not great. In later april 2016 I purchased six 125 amp hour AGM batteries for $1,480 delivered to Sydney from Brisbane. This will give us 750 amp hours, less than before, but I hope they will perform much better than the old ones and will be sufficient. 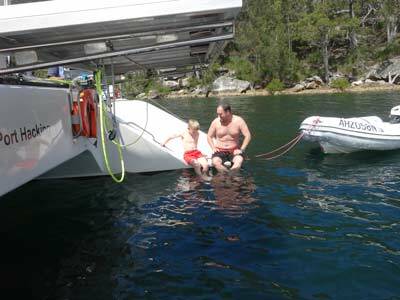 We have an AirX Airmarine wind generator but it was not working when we purchased the boat. In early March 2015 we removed it and a friend repaired it. We put back on soon after and in April 2015 I was able to test it. It then worked perfectly. We purchased a small 2000 kW inverter generator which we store under the chart table in the port hull. 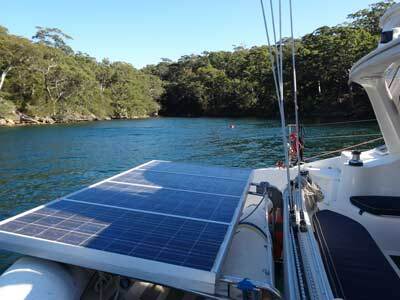 We can charge the batteries via the shore power inlet and also use it to heat water for showers etc when we are not using the engines. It is reasonably quiet, certainly not that intrusive if used for only a few hours. There are three fresh water tanks in the boat. There is 175 litres in one tank in the middle of the port hull. The starboard side has two tanks, one of 140 litres and another of 142 litres. The first is in the middle of the hull and the second towards the stern. This gives a total of just over 455 litres (120 US gallons). We also carry four containers that hold about another 88 litres, meaning 543 litres all up (142 US gallons). All the tanks are linked but can be isolated. This means that if we have to use suspect water, we can limit where it is stored and where it is used. There are two pumps, one on each side with an accumulator each. The water goes to the bathroom sink, the shower, the kitchen sink and the washing machine (this was located under the double bed and but was removed and will be disposed of). The water also runs to an outside shower at the top of the starboard boarding platform (where the swim ladder is located). 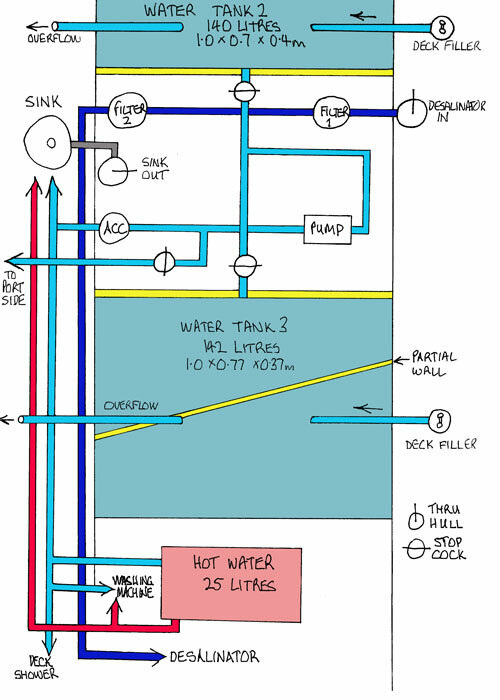 There are two hot water tanks, a 60 litre one in the port hull and a 25 litre in the starboard hull. Both are heated by heat exchangers from the engine on that side. Both can also be heated from shore power or generator. The starboard one only goes to the galley while the port one goes to the bathroom only. There is a freshwater deck shower on the starboard boarding platform. There is a saltwater deck wash that provides water to two deck washes. One is located in the anchor locker (which is where the fuel tank is located) and the other under the rear seat. We have a Spectra Ventura 150 Deluxe watermaker. This operates via a 12 volt pump. We did not use it till mid-April 2015 as it was "pickled" (laid up). Once unpickled, it must be run every five days so there is no point doing it till you are going to use it. Once we had it running we found it produces about 25 litres per hour. The 150 in the model means 150 US gallons per day, that is 555 litres per day, or 23.125 litres per hour. Therefore we appear to be getting a bit more than the specifications. 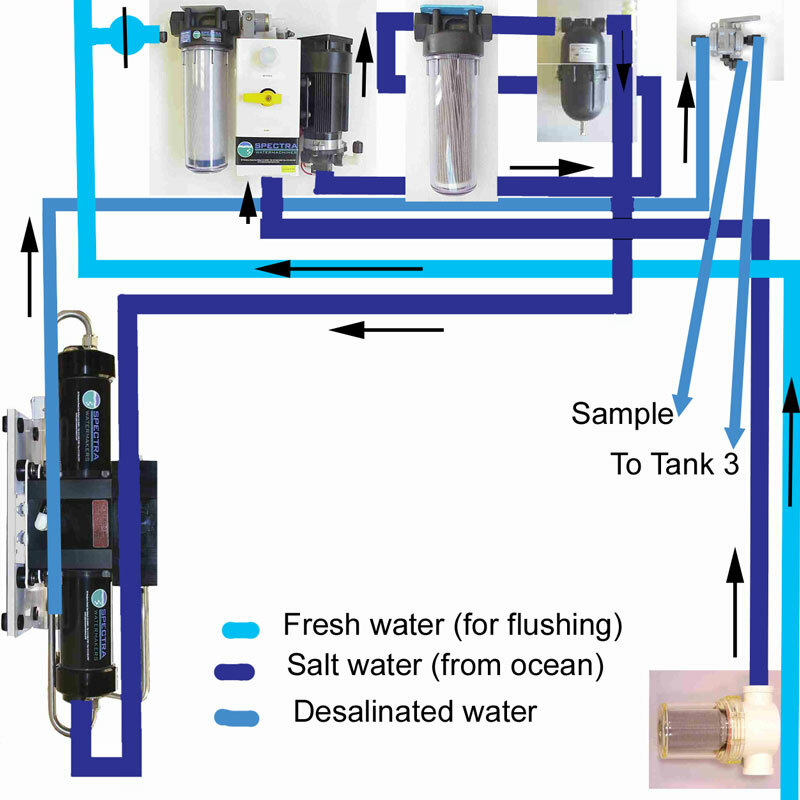 Click to enlarge A panoramic photo of the watermaker setup. Membrane section at left, pump and filters middle. 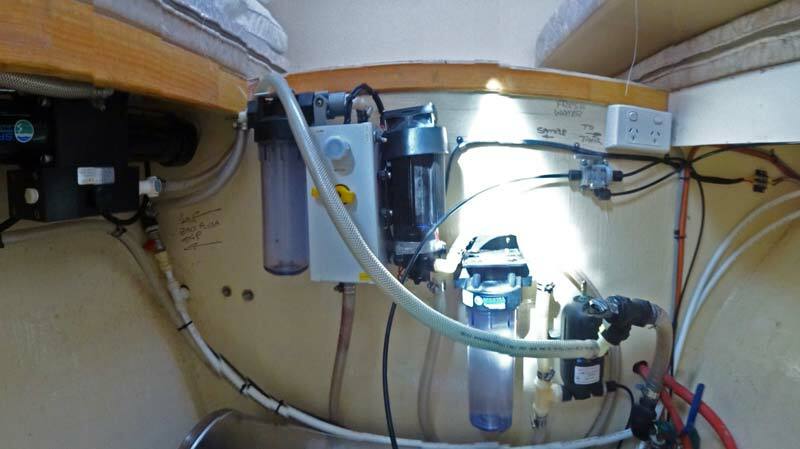 The watermaker is located under the double berth in the rear of the starboard hull and can be used to fill containers or the rear starboard water tank. It would have been better if the controls were placed in a more accessible location! I had proposed to set up a system on the main solar panels to catch rain which we could transfer via containers to the main tanks. I was going to do this sometime in March 2015 but still have not done it as on our 2015 trip we never needed it. We have a sand plough anchor with 70 metres of new chain (bought April 2015). This replaced 60 metres which had a very bad corroded section. The electric winch can be controlled from the helm and also can be lifted via a control at the winch. We have an anchor bridle to take the weight off the anchor winch. This is attached to U-bolts located on the outside of the cross-beam at the bow. There is also another anchor with some chain and a lot of rope (probably 100 metres). 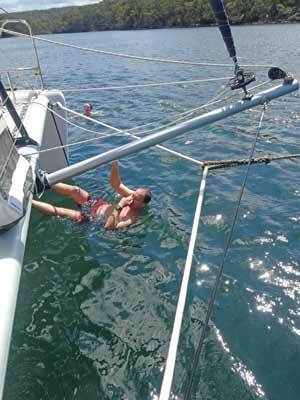 When we purchased it there was no way to easily attach to a mooring. This is presumably because the past two owners (at least) appear to have kept Pieces of Eight in a marina or at a private wharf. When we got home, I designed a couple of mooring bridles. The first attaches at each end to the same U-bolts located on the outside of the cross-beam at the bow that the anchor bridle uses. The second one attaches to cleats on the top of each bow. It runs through the cleat and hooks back onto it. Each line goes through the mooring loop. 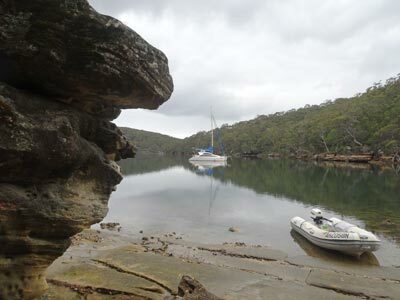 Normally we will only use the first one, but if very windy or when on our own mooring for extended periods, we use both. So much simpler to use. The tender is a 2004 Swift 3.4 metre RIB (ridged inflatable boat). It has an aluminium hull. The bow tube has a slow leak. It is powered by a 15 hp Mercury 2 stroke with a 9 inch diameter prop with 9 inch pitch. It has a 25 litre fuel tank (it really holds more as I put 27.6 litres in it in Queensland). The tender sits below the solar panels on davits and is raised and lowered using a deck winch. It has a couple of anchors, with some diving accessories like gear lines, deco line and mermaid. There are two reasonable sized trampolines at the bow. Each one has been totally re-engineered by me as the connection method was very bad and led to breakages. There is also a fair bit of deck space behind this and above the cabins. 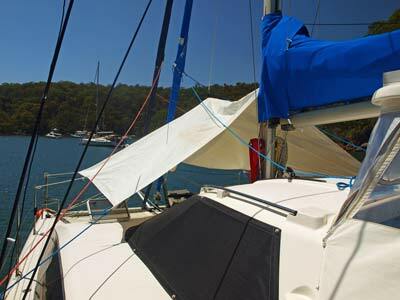 We have a sunshade made from sail material. This was custom made for the boat by a previous owner. 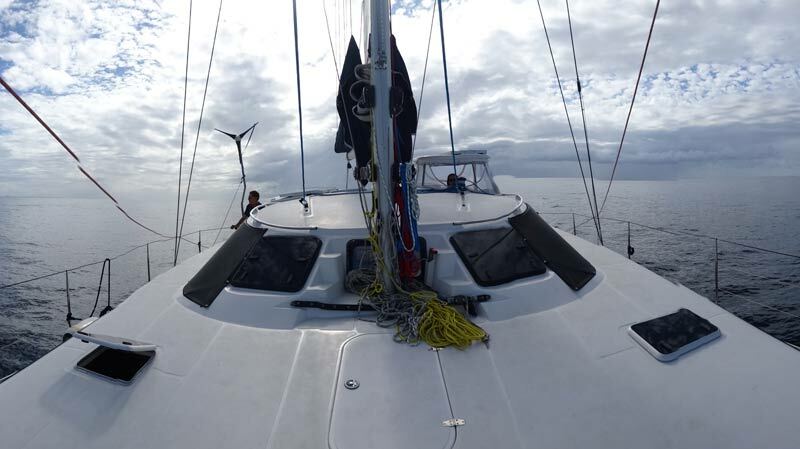 It connects to the front life line and the side stanchions and is held up by a halyard. It gives shade to the trampolines as well as the front cabins. There is also a rear rain protector and a separate shade cover. These sit behind the cockpit and provide protection to the whole cockpit area. There are also "doors" for this area.